The highest court of the United Methodist Church will hear oral arguments from people concerned with two cases that will appear on its Oct. 25-28 docket. The Judicial Council will hear oral arguments beginning at 9 a.m., Oct. 26, at the Vernon Manor Hotel in Cincinnati. Only interested parties or their designees have the right to address the council during the oral hearings, but the hearings are open to the public. The first case involves legislation enacted by the 2004 General Conference, and the second will address action by the Kansas East Annual (regional) Conference. 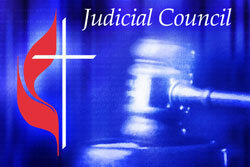 Dr. James Holsinger, president of the Judicial Council, granted requests for oral hearings for a case brought by the Commission on General Conference, which is responsible for planning the 2008 top legislative body of the denomination. Delegates to the 2004 General Conference session expanded the West Africa Central Conference to include the area that was home to the Protestant Methodist Church of Cote d?Ivoire (Ivory Coast). Church officials at the time estimated the size of the Cote d?Ivoire church at about a million members. 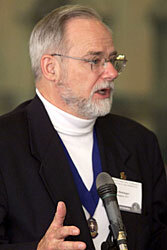 The assembly declared that two delegates would represent the conference at the 2008 meeting in Fort Worth, Texas. The Commission on General Conference is asking Judicial Council for more guidance, since that legislation appears to run contrary to the church?s Book of Discipline, which sets out a representation formula according to the number of clergy and lay members of an annual conference. If that determination were to be used, and if the church concluded that the Cote d?Ivoire Annual Conference had a million professing members in 2006, when delegation size is established, the conference would be entitled to as many as 70 delegates ? more than any other delegation. The size of General Conference is limited to 1,000 delegates, so the size of other delegations would have to be proportionally reduced if the Cote d?Ivoire contingent grew in size. In 2004, the Rev. Benjamin Boni (right) — later elected a bishop — and the Rev. 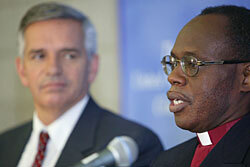 R. Randy Day announce the Protestant Methodist Church of Cote d’Ivoire is joining the United Methodist Church. The Kansas East item is related to a previous Judicial Council ruling, handed down a year ago and upheld in April. In Decision 1032, the council ruled that the pastor in charge of a local church has the power to determine who may be taken into membership of that congregation. The decision stemmed from a case in South Hill, Va., where the pastor refused to admit an openly homosexual man into church membership. At its session in June, the Kansas East Annual Conference passed a resolution that stated: "No pastor in the Kansas East Conference shall deny membership into a Kansas East United Methodist church solely based on the candidate for membership being a self-avowed, practicing homosexual." Immediately following approval of the petition, a motion passed which requested a declaratory decision by the Judicial Council on the non-discrimination petition. The council has a full slate of 20 items on its docket for the Oct. 25-28 session. *Caldwell is editor of the Virginia Advocate, the newspaper of the United Methodist Church's Virginia Annual (regional) Conference.